Location is 3½-4Hrs Drive North of Glasgow/Edinburgh and 2Hrs from Inverness! Saturday courses with the controllers route choices now available. 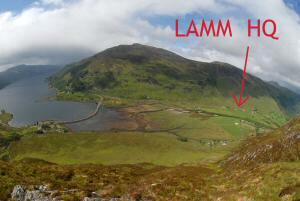 The LAMM venue is Morvich in Kintail. Morvich is reached by taking the A87 road towards Kyle of Lochalsh. 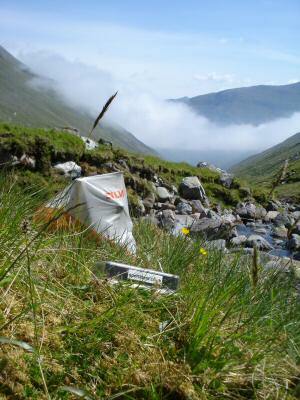 Bear right to Morvich 1.5 kilometres after Shiel Bridge. You'll see a yellow LAMM sign. Follow the minor road for 2 kilometres until you reach a T junction and you'll have made it to the LAMM. Parking is on the right at the junction and the Event Centre is in a huge field to your left. It will be a very short walk with your bags. Please do not use any public parking. Best to fill up with petrol on the east side of Fort William if you are coming that way but a word of warning - the Mountain Bike World Cup will take place in Fort William this weekend so there will be extra traffic on the A82 and in Fort Bill. We also think the A82 is closed after 22:00 each night from Tarbert for a few miles to Inverarnan due to roadworks and if you hit this problem you will need to divert via Inverary and Dalmally. Have a safe journey. We look forward to seeing you from 3pm onwards. Kintail is the area where a record 28 Munros were climbed within 24 hours by Jon Broxap in 1988 and it contains as large a concentration of big mountains as Ben Nevis and the Lochaber area. The Cluanie Ridge and Five Sisters of Kintail are very familiar to those who love the Scottish Mountains and big waterfalls. As with any LAMM this is big mountain country and in view of the weather forecast, the hills deserve extra respect and care. 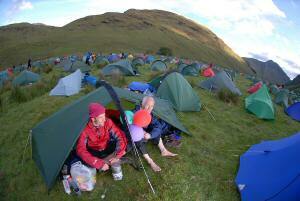 Think LAMM for spectacular mountain courses, think of an Autumn MM when considering what you need to carry! Our course planner is Angela Mudge, who has planned the LAMM courses on a number of occasions. 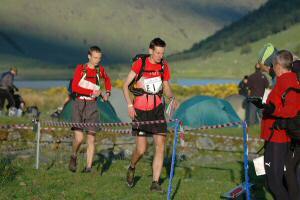 Andy Spenceley, who planned our courses at Inchnadamph and Glenfinnan, is our controller. He reports that these mountain generally have fast running on ridges and good going on the grassy slopes, however some marked paths are very boggy.. 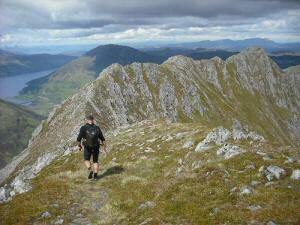 The Kintail area has a reasonable amount of accommodation but this year the B&Bs are really full. Please look at this list for availability. The LAMM Team would like to thank Lowe Alpine for being our title sponsor for all 16 LAMMs. Thanks also to SPORTident UK, SIDAS and High 5 for their support. We look forward to meeting you all again on Friday. Each competitor will carry an SI-Card and both members must punch at each checkpoint to avoid disqualification. This is intended to ensure that in future all unmanned checkpoints are visited by both team members. Both team members must visit registration to collect/show SI-Cards but it isn't necessary for both to visit at the same time. LAMM TIME OUT TEE - Find out more. SPECIAL ELITE PRIZE - Anders Morell who organises the BAMM - Bjorkliden Arctic MM has very kindly offered a prize of a free entry for the BAMM on 14 - 15th August 2009. The prize will include transport from Kiruna Airport and accommodation/food at the Bjorkliden Hotel the night before and after the event. The LAMM will upgrade this prize and we will pay for the appropriate flights from a UK airport to Kiruna. Bjorkliden is located 200km (124 miles) north of the Arctic Circle just north of Sweden's Abisko National Park, almost on the border with Norway. For the second time this year, the LAMM will have on board the highly experienced Athletes Angels at the finish. Athletes Angels provide sports massage and physio for endurance and outdoor sports events across the UK and Europe and will be on hand to tend to weary muscles, creaky joints and any sprains or injuries at the end of the race. As many will know, a thorough sports massage at the end of an event can make all the difference in the recovery stages! For more information please visit www.athletesangels.com and to pre-register (highly recommended!) for an appointment please email info@athletesangels.com. The team will be at the Event Centre from 10.00 am on the Sunday and a 20 minute appointment will cost £10, if you wish a longer appointment please specify when you pre-register. Photographer Jon Brooke will be out on the course attempting to capture at least one image of every team. His pictures will be available to purchase online a day or two after the event via his website www.rightplacerighttime.co.uk. The images will be available as JPEG files for personal (non-commercial use). They come in two different sizes suitable for regular prints or enlargements. The large file would probably be acceptable up to A3 size at least. Those taking part in the Chasing start on Sunday will be wearing race numbers front and back and can search for photos using their race number. Payment can be made using any credit card (via Paypal) and no registration or other faffing is required. Prices are £4.95 and £7.95 respectively. The LAMM Team would like to thank Lowe Alpine for being our title sponsor for all 16 LAMMs. Thanks also to SPORTident UK, SIDAS and High 5 for their support.We look forward to meeting you all again on Friday.